Manicurist filing nails of her client doing manicure.Beautician hand filing nails of woman in salon. manucurist women sitting in spa salon and relaxing.Beautician filing female clients thumb and nails at spa beauty salon.Spa treatments, beauty center. Beautician filing nails, slow motion. Manicure specialist polishing nails to client with file in beauty salon close up. Woman receiving manicure. Beautician filing nails to young woman. Female hands in beauty salon receiving manicure. Skin and nails care. Beautician filing nails to elderly client. Woman hands in nail salon receiving manicure. Old woman is getting manicure in a beauty salon. Manicurist filing nails, slow motion. Nail beautician in blue gloves polishing nails to female client close up. Woman hands receiving manicure. Beautician filing nail to client close up. Cosmetician in blue gloves filing nails with file close up. Young woman hands in nail salon receiving manicure. Woman filing nails in spa salon. 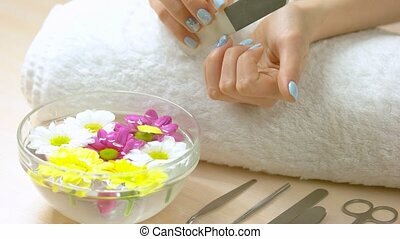 Female hands with nails file, glass bowl with water and chrysanthemums, manicure equipment. Beauty and spa salon. Closeup woman in nail salon receiving manicure by beautician with nail file. Manicure master filing nails using nailfile in beauty salon. Side view. Beautician filing female client's thumb and nails at spa beauty salon. Nail master filing nails to aged client. Elderly woman receiving manicure in professional nail studio close up. Beautician in gloves polishing nails to client. The process of buffing nails by manicurist. Beautiful female hands having spa manicure at beauty salon. 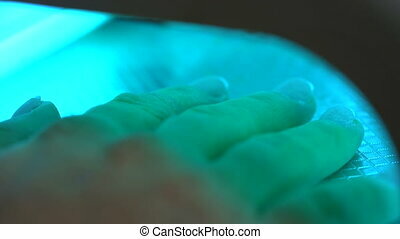 Closeup hands of professional pedicurist in blue gloves shaping the toenail of female client with nail file in beauty salon. Nail master giving pedicure to woman and filing toenail with nail file at nail salon. Foot treatment and nail concept. Manicure degreasing nails before applying nail polish. Cosmetologist make manicure. beautician making preparations for manicure. Hands woman close up Close up of a woman hand. master make manicure. Close up of a manicurist filing woman's nails in the salon. Doing woman's manicure by professional manicurist. manicure making - female hands, covering of transparent enamel.Woman hands in a nail salon receiving a manicure by a beautician, nail polish. Woman getting nail manicure, body care, spa treatments. Spa treatments, beauty center. manicure making - female hands, covering of transparent enamel.Woman hands in a nail salon receiving a manicure by a beautician, nail polish. Woman getting nail manicure, body care, spa treatments. Spa treatments, beauty center. In a the beauty salon.